The Nokia N93 in theory was a great idea but in practice a bit of a ’mare to use. Its makers rightly knew that camcorders were not something a person takes with them everyday, making the enjoyment of on-the-go filmmaking nearly non-existent. So Nokia looked at the hugely successful cameraphone model – it’s a camera and a phone! – and decided to apply this to videomakers. As a mini camcorder, the N93 was a decent bit of kit – Carl Zeiss lens, 3x optical zoom, 3.2MP footage. The problem was that it was too chunky to be your everyday phone, so the whole idea of it being a take-everywhere device went out the window. It successor, the N93i was sleeker but still a tad too chunky for your pocket. The obvious step then is for Nokia to make its new camcorder/phone thinner. Well, if the company’s leaked patent, as spotted by Tech Digest, is anything to go by, then smaller simply isn’t the case. The crude black-and-white sketch shows a heftier upwards sliding model that looks mightily similar to its brethren. A new feature that’s sketched is a swivelling lens that makes the product look more like Johnny 5 than the N95. 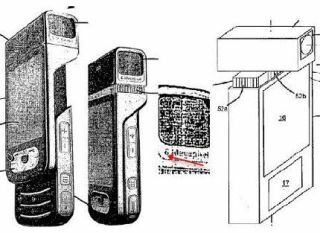 Even if this is a very early mock-up – which it more than likely is – Nokia's new videophone (rumoured to be the N85) needs to shed a few inches before it’s destined for budding videographers’ pockets everywhere.